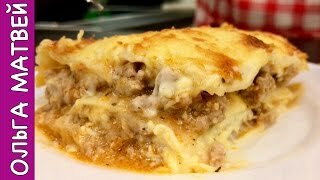 Домашняя Лазанья (Простой Рецепт) | Lasagna Recipe, English Subtitles. Как приготовить? Hello all! This is "Cooking's Easy" channel and me, Olga Matvey. There is a lasagna recipe on my channel, but today we'll cook it in an easier way:. You won't need many products. The dough will also be cooked. If you don't want to spend time on cooking the dough, you can just buy it.. So, for the dough we will need some flour, 2 eggs, some salt, sunflower oil. For 1 egg you will need 100 grams (3.5 oz) of flour.. I will take 200 grams (7 oz) of flour, because I will use 2 eggs. Add a half of teaspoon salt into the flour. Stir it up. Put the flour on the surface where we will stir it up..
You must wonder why I do it with my hands. But not all the people have a food processor..
Kneading dough with hands differs from kneading with a food processor: the amount of flour will be different. I'll show you a classic recipe. If there is a food processor, it takes much less time..
Make a hole in the flour. Add 2 eggs here and start kneading.. The dough is supposed to be tight.. When all the dough is gathered together, add 2 tablespoons oil. Knead it.. While kneading the dough will deliver some crumbs. Just put them aside..
You will need 10-15 minutes to knead the dough with hands. It's pretty hard for it's rather tight. Food processor would be really helpful in this case.. The dough is ready, it's pretty tight. I'll wrap it into the kitchen film and put in the fridge for 45-60 minutes..
Now you'll need some mincemeat. You can either cook it yourself or buy it. I used about a kilo of beef (35 oz), some cheese and some dry (or semi-dry is also possible) white whine.. I've got a couple of tablespoons Italian grasses here. You can take any but basil is a must. And some salt and some allspice..
Usual tomatoes will deliver the best taste.. Some cloves of garlic, 1 big onion or 2 small ones. Half a liter of milk, grated nutmeg and 50-60 grams of butter (2 oz)..
Cut the tomatoes crosswise. Boil some water. If the tomatoes are not very juicy, you can add some tomato juice or some ketchup..
Pour them with boiling water for some minutes. Cut the onion..
Pour some oil in a frying pan and let it heat. Put the onion here dividing it into separate pieces.. In couple of minutes pour out the water. The tomato skins are easily removed. Grate the tomatoes.. When the tomatoes are in season you can chop them instead. Squeeze 1-2 cloves of garlic..
Add some grasses here and some hot peppers if you'd love to. Now a half of teaspoon salt and some pepper.. I would also add some allspice..
Fresh basil is more preferable than the dried one. Make sure you add it as well..
Grate some cheese. Either Parmesan or any other one.. When the onion gets golden, add the mincemeat here and stir it up with the onion.. I've been cooking meat for 10 minutes now. It's changed its color, but still a bit raw. Add a teaspoon of salt..
Now I'll add all the tomatoes and stir it. You can add some ketchup or tomato juice..
Stir it up and set a middle temperature, cover and cook until ready so that all the liquid disappears..
Heat some milk to cook Bechamel. Put a small pan on the stove and melt a piece of butter at a low temperature..
Add 4 tablespoons flour and quickly knead this kind of dough..
Switch off the stove to prevent burning.. The milk is hot now. I switch off the stove and stir the butter and the flour with the milk so that the mass is not lumpy. I use the whisk for that..
Ladle by ladle. If you pour everything at once it will get lumpy.. There is a video on my channel that will teach you to cook Bechamel..
Add some nutmeg and some salt in the milk..
Now it's over, I've used all the milk. Look what smooth Bechamel's here.. It shouldn't be savorless, so make sure there's enough salt..
After 20 minutes of cooking meat try it for salt. Add some dry or semi-dry white wine and stir it up.. If it's not going to be eaten by kids, add it 10 minutes before being ready. I will cook it for 30-60 minutes more. I add the wine now to release the alcohol and leave only taste and flavor of wine.. I stir it up, cover and wait for the meat to be ready and all the liquid to disappear.. The meat is ready now: there isn't much liquid left. Make sure there's enough salt. Switch it off and start cooking pasta..
Take the dough out of the fridge. The longer you've held it in the fridge, the better. It will be more elastic this way.. It's so yellow due to eggs and feels very pleasant. I will roll it out with Kenwood nozzles that are applied to my food processor.. If you don't have such ones, watch my video on cooking lasagna, I show there how to roll the dough with a usual rolling pin. The link is available at the end of this video..
My subscribers in Ukraine have discounts for Kenwood products: 15% for nozzles and 10% for food processors. See the information below the video..
Make a roll of the dough and divide it into 3 parts. Now it's quite easy to do it..
Make it flat and sprinkle it with flour at both sides. First roll it out at the thickest mode..
Then fold it in half and roll it like that..
Sprinkle the dough with flour at both sides when rolling out. You need to roll it out to 1.5 mm.. I will use not a big mold.. The sheets should be boiled. Boil the water and salt it. Add some sunflower oil.. Prepare a pan with cold water or even add some pieces of ice there. Add some sunflower oil here as well.. When the water starts boiling, add there 1 sheet (or 2-3 if the pan is big). Boil it for 1 minute (not more) and take out.. Put it into the cold water at once..
Take a colander and put there all the boiled sheets. Each sheet is to be uncrumpled to be easily used afterwards..
Everything is ready, so I start collecting lasagna. Add just a bit of sauce on the bottom.. If there's too much of it, lasagna will not keep its shape when ready.. Put the sheets, take off the ends. You can use any mold for cooking, just be aware that lasagna will get wider. Put the mincemeat, but not to the edges..
Cover it with Bechamel, but not too much of it. Then top it with cheese.. I use usual cheese, so this recipe doesn't take much money to cook. Put the next sheets.. Here's the last layer of lasagna. It is not to be covered with meat, just top it with Bechamel and sprinkle with cheese..
Bake it at 360F for half an hour. Any cheese can be used here..
Usually there are 3 of them in such a mold, 20 by 20 cm..
You are not obliged to cook all of them at once, 1 can be cooked today, another one - tomorrow..
Basically the sheets don't stick to each other. But if they do, put them into cold water for a minute..
Take out the lasagna from the oven and leave it for 15 minutes. It can be cut in portions, all the liquid has been absorbed by the sheets..
Let's see how it looks like on the inside. If we used Mozzarella cheese, it would stretch and look even tastier. But this is a good deal recipe..